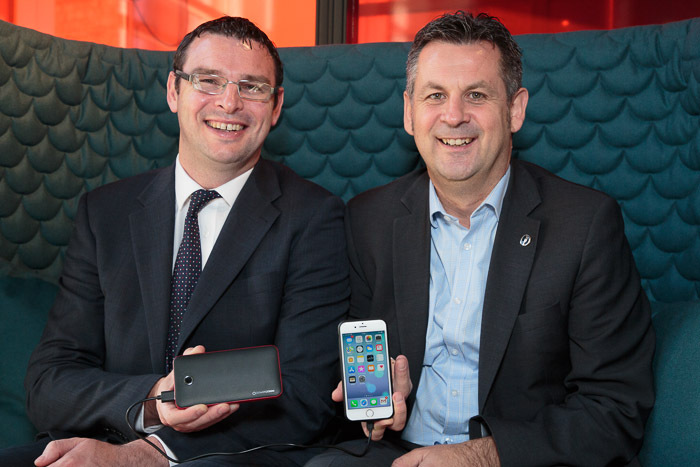 Peter Waggott, Managing Director of Powercases (Scotland) Ltd, (right) shows David Robertson, Technology Solutions Manager at Staples Solutions, how the Powercases Universal Charger works at the Indigo Hotel, Dundee. A Scottish startup selling cutting edge off-grid power products has landed a substantial five-figure order from Staples Solutions UK as its first deal. Dundee-based Powercases (Scotland) Ltd is the European arm of the Canadian Powercases brand which since 2012 has created state-of-the-art Lithium-Ion rechargeable power packs and cases for devices such as phones and laptops as well as jump-starters for cars, motorcycles and boats. The startup, headed by sales coach Peter Waggott – a Member of St Andrews Business Club, recently closed its first deal – a distributor agreement and substantial five-figure order for three products with Staples Solutions UK, the leading provider of workplace products, services and solutions to businesses in the UK and Europe. Powercases expects the relationship to grow into a seven-figure revenue stream over the next 12 months. Powercases is in advanced talks with Kia and Subaru Canada to offer its range of products via dealerships there. It’s looking to do the same in the UK. Peter Waggott’s sales and management coaching company, Vertical Motives, will also offer sales and management training to Staples customers. Earlier this year his two-day sales workshop became the first in the UK to be accredited by a university as Recognised Prior Learning when the University of Aberdeen allowed completion of it to be used by prospective online MBA candidates as part of their application. Powercases (Scotland) Ltd is currently looking to secure office space in Dundee to base itself and conduct training at. Peter Waggott was approached by Powercases to open its European arm because he worked for four years from 2010 with its Co-owner and Managing Partner, Taylor Angus, at Wakefield Castrol Canada Inc. Speaking about the deal, Peter Waggott said: “We’re naturally delighted our first European customer is the region’s biggest supplier of workplace products, services and solutions. “In today’s work environment having power on demand to stay connected is crucial. Powercases products allow people to stay connected wherever they are. It’s great to have this iconic office supplies chain recognise the superiority of our products in meeting this need with this initial order.